The FSBI was formed as a professional society in 1967 and has become internationally renowned for its scientific activity in fish biology and fisheries science. In the mid-1960s, several annual conferences on fish ecology were initiated in Liverpool by Jack W Jones, a member of the Department of Zoology at the University of Liverpool. During the third of these so-called Coarse Fish Conferences, in March 1967, informal discussion took place about the formation of a British society for fisheries biology. Participants in the discussion included Jack Jones, David Le Cren, a biologist at the Windermere Freshwater Biology Laboratory, Peter Tombleson, an angling journalist and administrator, Lionel Mawdesley-Thomas, a fish pathologist at the Huntingdon Research Centre, and Alwyne Wheeler, a taxonomist at the Natural History Museum, London. The discussions led to an inaugural meeting of the Fisheries Society of the British Isles on 21 October 1967 at the meeting rooms of the Zoological Society, London. Jack W Jones became the first President of the Society. These five people were responsible for founding the new Society and for guiding it through its early years. 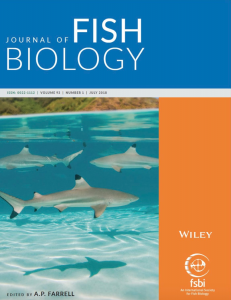 James Chubb, also from the Department of Zoology, University of Liverpool, was appointed as the first editor of the Journal of Fish Biology. Join the FSBI today to get access to the Journal of Fish Biology, grant opportunities and reduced fees for our annual symposium. In 1992, at the quarter centenary conference in Liverpool the Jack Jones lecture was inaugurated in his memory as founding President. At the Annual International Symposium, held each July, one invited speaker is selected to give the Jack Jones Lecture. The first Jack Jones lecture was given in Liverpool by Geoff Parker from Jones' former department. Subsequent speakers have included Larry Dill, Richard Haedrich, Ed Houde, Daniel Pauly and Kurt Fausch. The FSBI is a founder member of the World Council of Fisheries Societies, which co-ordinates activity of national and international fisheries societies and organises the World Fisheries Congress every four years. In 2012, the FSBI led the organisation of the 6th World Fisheries Congress in Edinburgh, which was opened by HRH Prince Charles. The FSBI has close working relationships with a number of other similalrly focused organisations, including the American Fisheries Society, the Japanese Society of Fisheries Science and the China Society of Fisheries, as well as close ties to the Canada Conference for Fisheries Research and the Australian Society for Fish Biology. The Societies maintain close links and the respective Presidents regularly attend and contribute to each other's annual conferences, exchanging information and furthering international interactions.